Do you like green eggs and ham? Would you like them in a house? Would you like them with a mouse? Would you eat them in a box? Would you eat them with a fox? Would you? Could you? In a car? Eat them! Eat them! Here they are! Most people in the English-speaking world should at least be familiar with Dr. Seuss's Green Eggs and Ham. As a concept, they are quite gross. Think rotten eggs and ham. 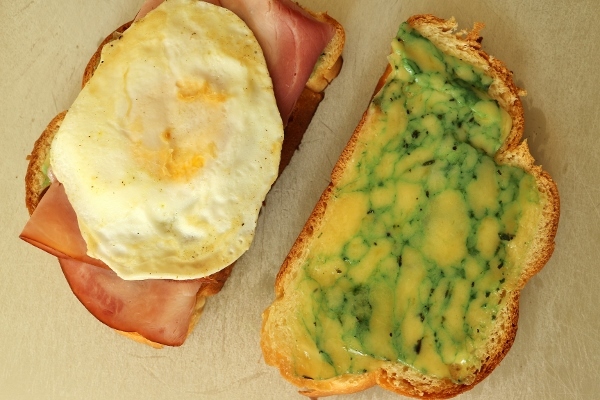 But truly, they are one of the most epic combinations to be recreated in the home kitchen using clever techniques to add green color to eggs and ham. Ready to grill this cheese! 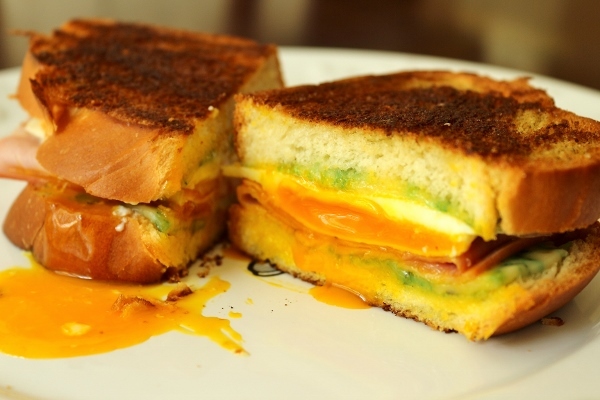 An easy way to achieve this would be to make a ham omelet with pureed greens, but an even more fun idea is to take this idea and transform it into a grilled cheese blurring the line between breakfast and lunch. The key ingredient here is sage Derby cheese. Now this is not your ordinary cheese. 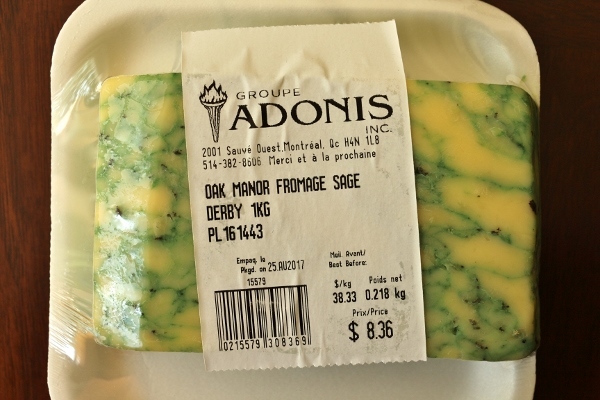 I sought out this green-hued cheese at local cheese shops and cheese counters at well-stocked supermarkets in my area with no success. I found it available online, but at an obnoxious price once accounting for shipping (and with a requirement to purchase way more cheese than I really needed). I put this cheese search on the back burner, hoping it would turn up someday, and luckily for me it did! I was recently visiting family in Montreal, doing some grocery shopping at my favorite grocery store ever Marché Adonis. Lo and behold in my peripheral vision in the cheese display I saw a giant wheel of green cheese. Oh, could it be? Could it be the cheese for me? It was the sage Derby cheese I had been seeking for weeks! Needless to say, I purchased some of that cheese immediately and even shared the excitement on my Instagram account for the world to share in my joy! 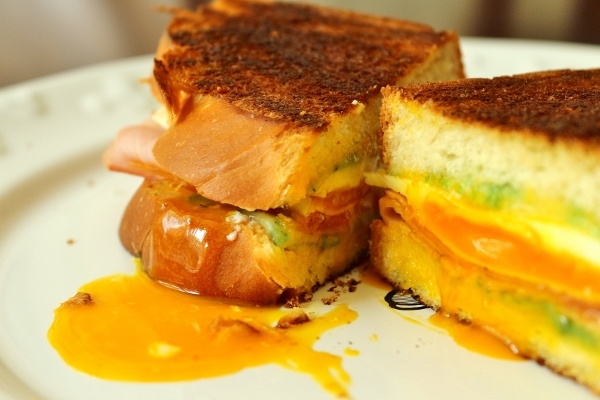 So the sage Derby cheese is literally the glue the holds this sandwich together, and is also what makes it "green." The cheese is also absolutely delicious on its own, and is reminiscent of a good cheddar. With that said, the other ingredients are just as important. 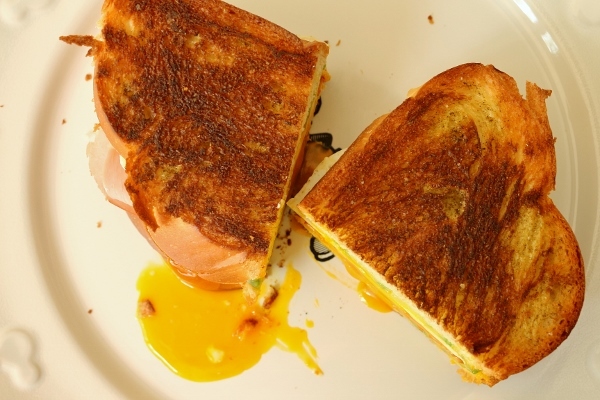 Egg enriched challah bread makes this sandwich extra special, along with thinly sliced ham, and a fried egg with lots and lots of runny golden yolk. 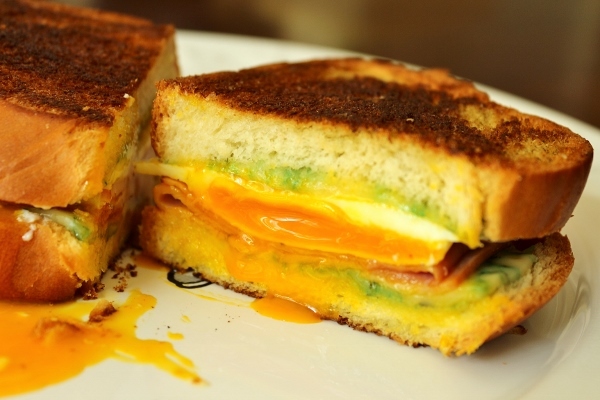 If you can find a source for sage Derby cheese, seriously make this sandwich! It's so yummy, and it's actually super easy to make (way easier than it was for me to buy this cheese). 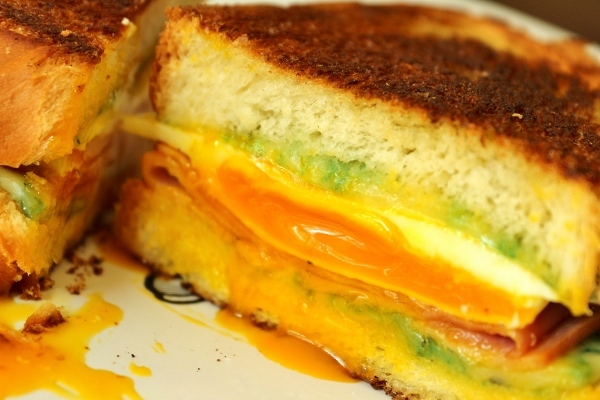 Another cheese would also be great in this sandwich, but it would no longer be "green." You can definitely fry your egg alongside your sandwich in the same pan, but I tried both ways and preferred frying mine in a separate frying pan. No biggie either way. In a small bowl, stir together the butter and sage until well blended. 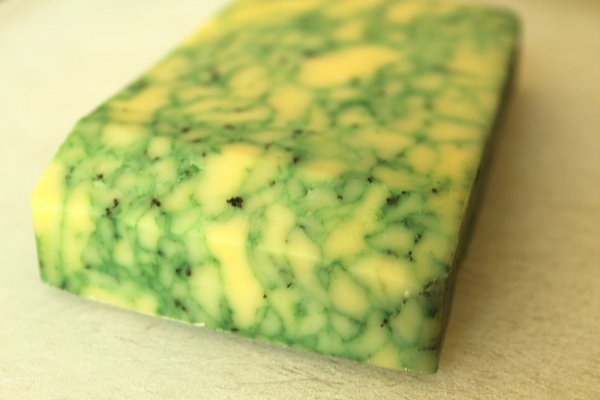 Spread half the sage butter on one side of two of the bread slices, dividing it evenly. Place both slices, buttered-side down, on a clean cutting board. 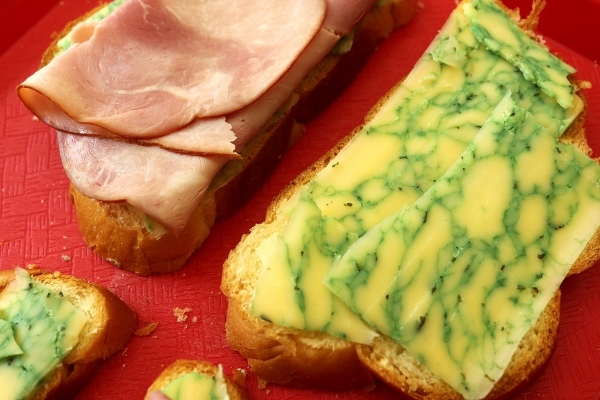 Place one slice of the Derby on each bread slice, then lay half of the ham on top of the cheese on one slice. Using a wide spatula, transfer the two breads, buttered-side down, to the hot skillet. Coat a clear area in the pan with nonstick cooking spray, then carefully crack one of the eggs into the greased space. Sprinkle the egg with salt and pepper (I cooked my egg in a separate smaller frying pan). While the egg is cooking, keep an eye on your breads. When the bottoms are nicely browned and the cheese is melted, about 2 minutes, return them to the cutting board. When the egg white is mostly cooked through, carefully flip the egg with a silicone spatula. 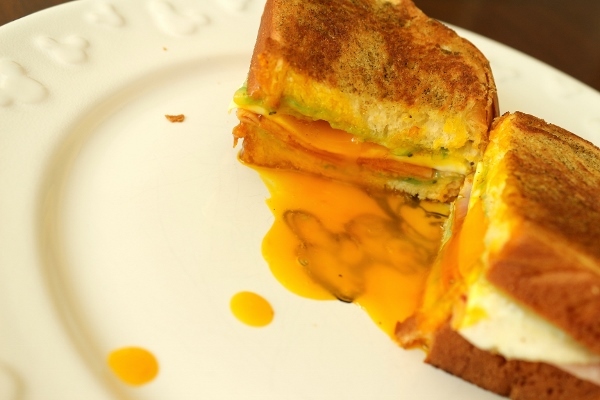 (Don’t worry if you break the yolk; it will still be delicious.) Cook for about 30 seconds longer, or until the egg white is fully cooked but the yolk is still soft. 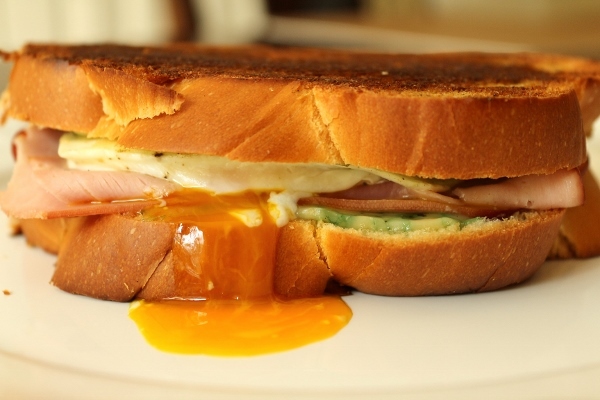 Slide the fried egg on top of the ham and gently place the other bread on top, cheese-side down. Cut the sandwich in half, if desired, and serve. Repeat to cook and assemble the second sandwich.